For a couple of weeks now the world has been held enthralled by U.S Presidents pronouncements about meeting Kim Jong Un. It was on, then it wasn’t and then it finally took place on the 12th June. North Korean Leader, Kim Jong Un and Donald Trump met in Singapore and signed an agreement whose terms aren’t exactly clear. According to Trump, The U.S made a commitment to give certain security guarantees in exchange for the denuclearization of the Korean Peninsula. This is the first time an American President has ever met with a North Korean leader. Trump has announced that America will be calling off the joint military exercises that the U.S has been having for years with South Korea. This historic meeting, vague as it might seem to most, will obviously have an impact on the prices of gold. The price of gold reacted by going high when the possibility of the summit being cancelled was reported. This was to be expected since gold normally thrives at the first signs of geopolitical tensions. However, it entered the week of the scheduled summit on shaky ground. Its price declined by more than 1.1 percent. There could have been other reasons causing the decline, but it was clear that when the news of Korea suspending its nuclear program, it reduced the geopolitical risk thereby diminishing the value of gold as a safe haven asset. But what exactly did these two leaders agree to? Is North Korea really abandoning its nuclear program? The world was puzzled about this, especially when North Korea published a resolution to “proclaim great victory of developing and economically constructing and building a nuclear arsenal.” This did not sound anything like what Trump reported back. Of course, his report was succinctly communicated in a Tweet that mentioned that North Korea had in fact agreed to suspend tests and close major nuclear test sites. Many in the news debated what this suspension actually meant. Is it a temporary halt? Is it a precursor to some major deal? Then again the word itself may imply that Korea already has a nuclear arsenal and have already learned to use it and won’t have to test it again. Suspension, implies that the thing will be around, available for use if the other party decides to do so for whatever reason. It is possible that Korea has finally decided to abandon its stand-off with the West. Why? Because North Korea wants the threat of U.S troops in South Korea and Japan gone. North Korea might have come to realise the futility of a nuclear war, or the wasteful expenditure of reasons and human beings in the creation of weapons that may never be used. Kim Jong In might have just opened up to discussions and possible peace talks with the West and South Korea by extension. What does this mean for the economy or more importantly, the precious metals market. It might have shaken up the markets, but the idea that peace is what these two leaders agreed to is a long stretch. The threat is still there, so gold shouldn’t be affected that much. Whether things escalate in the Korean Peninsula or not, the value of gold will not be degraded. When Kim Jong Un was inspecting ballistic missiles, making provocative propaganda videos about wiping out the United States that just became the usual state of affairs that had stopped having that much of an impact on gold. There might be some short term effects. Reduced tensions may reduce the demand for precious metals like gold. It has happened over the last couple of weeks. The hint of a possible end to an impending nuclear Apocalypse affected the gold price. What happens now that “the deal” was signed? 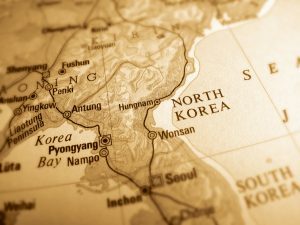 Does North Korea go on a mission to repair relations with its neighbours and the rest of the world? Is the risk over? Where is gold going? At the moment it’s a “wait and see” game. There is a lot that is happening in the U.S. Markets are pumped up or crashed by a single tweet from POTUS himself. You may want to hold on to your gold. The year has only begun, it’s a long way to the end of the year and anything can happen.